The wait is over, you as breeders asked for it, Now We've Got It! Rock Star was the most popular bulls on display at the NWSS and Iowa Beef Expo. Rock Star's extreme slender neck, Massive Shape of his Top and Thickness through his hind quarter, not to mention his Stoutness of Bone, Structural Correctness, Mobility and Width of Stance are Second to None. All of this combined with his great genetics on both the sire and dam sides. This is truly a unique blend of livestock genetics. Heat Wave furnished his squareness of hip and stoutness of lower quarter along with enormous bone and tremendous hair. P.S. Power Play Angus females are known for their calving ability, milk gift, ease of flushing and prolific breeding is a bonus. 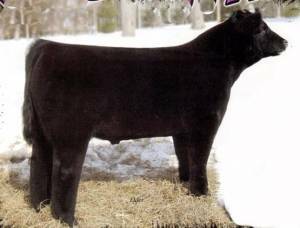 Rock Star is sure to produce sound, functional cattle that will work virtually in any herd. Make this a must bull to use this season and seasons to come.